Can Superheroes Assert Legal Rights Without Revealing Their Identities? Welcome to the All-New, All-Different Postal Apocalypse! It’s like nothing you’ve ever seen before, unless you’ve actually read my silly little mail column before. 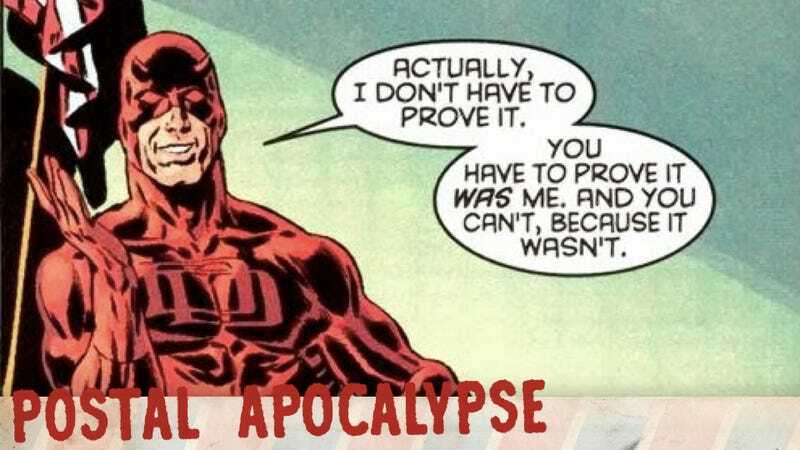 I have a superhero legal question that is going to blow your mind — seriously! — followed by The Force Awakens, Batman V. Superman, Game of Thrones and more! Postal worker of the far future! I was wondering something the other day and realised you were the most qualified person I knew who could answer it (interpret that as you wish). If I was a random person in (say) the Marvel universe, and I (say) sold a toy with the likeness of (SAY) Spider-Man... could he sue me? Is there any possible way for Spider-Man to protect his (highly marketable) brand image? Obviously he’s never tried to sue the Bugle for libel, but that could be out of fear for his job and (I imagine) because he likes most of the people there. Who owns the Trademark (or IP or whatever) on the various Marvel heroes in the Marvel universe?! In the MCU in Agents of Shield we see Avengers action figures. Does Stark Industries manufacture those? How did Tony acquire the image rights to the other Avengers? Do the others get a cut?! IMPORTANT QUESTIONS!! By an odd coincidence, Ms. Postman is a lawyer by trade, and is friends with a great many other lawyers in my strange, post-apocalyptic town (which has fake mailmen and lawyers, but not, say, blacksmiths. Go figure). When I asked your question to them, hoping to get a simple response, they actually cackled at my naiveté. Turns out it was just a touch more complicated than I thought. But I did get the answer, with the especially helpful assistance of one Carolyn H. Thank you again, Carolyn! In order for Spider-Man to even need to sue Times Square Guy, TSQ would have to simply refuse to stop making unauthorized Spidey merchandise. But this means TSQ has to show up in court and basically claim “Spider-Man said I could sell this junk”, which is something TSQ can not even slightly prove. All Spider-Man would have to do to shut TSQ down is reveal he’s Peter Parker, demonstrate that he’s Spider-Man to the court’s satisfaction, and announce TSG is lying. Boom. Done. Of course, this means that Spider-Man would need to reveal his secret identity, and we all know how badly it goes for him when that happens. 2) One that details the intellectual property rights owned by Spider-Man, including trademarks, copyrights, and publicity rights, and explaining how they were first created. 3) One that grants to his lawyer full power of attorney to act in Spider-Man’s behalf. And finally the lawyer would then throw these documents into a very large safe, and possible move the safe to the Negative Zone so supervillains can’t get their hands on them. At this point, the lawyer can sue Times Square Guy into oblivion. And the lawyer could also exclusively license Spidey’s trademark rights to a company such as Stark Enterprises. I get the feeling that Stark has had to go through this with the dozens and dozens of heroes that have served as Avengers over the years so many times that he’s got a special lawyer or law firm or law robots specifically to lock these rights down for members — hell, maybe even potential members. Again, She-Hulk or Daredevil would be required for any hero that wants to stay anonymous, but eventually Tony would get merchandising rights — and, just as importantly — prevent others from pulling stupid crap like Times Square Guy. I don’t know how too put this, but here goes. In the original trilogy, and in all the books and stuff, Stormtroopers were always white men. In The Force Awakens, there’s a black Stormtropper and if the rumors are true at least one female Stormtrooper. This change bugs me, but NOT because I’m a racist (I know everyone who says that sounds like a racist but here me out.) The Empire only has white men as Stormtrooper because they hated aliens and were sexist. It was part of what made them evil, and what made the Rebel Alliance good, because all sorts of aliens were part of it. And a major part! They had an alien for an Admiral! I’m all for diversity in reality –- REALLY!!! – but it seems weird that the Evil Empire has gotten more diverse over time. It just makes them less evil to me. Does this make sense? Or am I secretly a racist? I don’t want to be a racist! Don’t worry, Max Rebo (which I’m certain is your real name). I see what you’re saying. Racism and sexism are evil. The Empire is evil. If the Empire has done away with racism and sexism in The Force Awakens, doesn’t that make them less evil? It might strike you as vaguely disconcerting for the Rebels (or whatever they’re calling themselves in Episode VII) to be attacking an entity that is technically improving, but I feel extremely confident that the Empire — or whatever remains of it — will be plenty evil even if they have instituted better hiring policies. I mean, they built not one but two space stations capable of committing planetary genocide. No amount of workforce diversity makes up for badness like that. Besides, I’m guessing — and I bet the movie makes a point to make this clear — that the Empire has been forced to be less choosy about its troops, because they’ve lost so many resources to the Rebels since RotJ. They have control of fewer planets, and thus are forcing whoever can hold a gun into the Imperial army to fight their battles — including John Boyega. Because he does not look at all happy to be serving the Empire in the trailers. What happened to Arya’s list [on Game of thrones]? In last week’s episode she says the names The Mountain, Cersei, Walder Frey and Meryn Trant as the people she needs to kill. Obviously, Tywin and the Hound are dead as far as she knows. But what happened to the others? Where’s Ilyn Payne, Melisandre, Beric and Thoros? I’m getting worried the show is already getting too off track from the books. This is just the show paring itself down to a reasonable length. Before you decry that its ruining the books, please remember GRRM has, essentially, an infinite amount of pages to write up everything he wants to happen. If the show sticks to its guns and sticks to seven seasons, we don’t have much more that 25 hours of Game of Thrones TV to watch. And there’s a ton of stuff that needs to happen in this time frame. But watching Arya kill all eight or so people on her list is not one of them. All we need to do is see her kill a few to get the point (or the pointy end, as the case may be). I mean, if it came down to watching Arya hunt down and kill Joffrey’s headsman Ilyn Payne, or giving an extra 10 minutes of screentime to the final battle with the White Walkers, we’d all choose the White Walkers, right? As for why certain names have been removed while others have stayed, I imagine that showrunners David Benioff and D.B. Weiss have come to the conclusion that Arya meeting back up with Melisandre and the Brotherhood with Borders isn’t going to happen in the show’s remaining timeframe. As for Ilyn Payne, I bet they assume most GoT’s non-nerdy audience has forgotten who Payne is, and could safely drop him — and that leaving him in might just confuse people. As for the names remaining, even if Arya won’t be killing them herself, they’re obviously the ones that Arya would most want dead — Cersei and Walder Frey for betraying the Starks, and the Mountain for the horrors he inflicted at Harrenhal. Sir Meryn Trant is the exception — he’s the dude who (presumably) killed Arya’s swordfighting teacher Syrio Forel back in season one, but I imagine most audience members would have forgotten him entirely because he’s such a minor character. So why does Arya remember? Because Benioff and Weiss need audiences to remember the character, too. If there’s anyone on Arya’s list that she’s going to cross off herself, I thinking its going to be Trant. Recently we watched Star Wars Episodes IV, V and VI with our young daughter, who is seeing them for the first time. Her fresh reactions to all of it have caused me to vicariously see everything in the trilogy through new eyes, especially what, for me, is the big payoff: the moment when Vader turns on the Emperor and kills him to save Luke, and at the cost of his own life. It’s obviously meant to elicit gasps and amazement from the viewer, but then again, should it? I know use of the Dark Side of the Force apparently corrupts you and makes you more willing to harm others and overpower them to get your way, but are we reasonable to think it might make you able to sit back and do nothing when another person, even a fellow Sith Lord, is torturing your child to death in front of you? True, Vader seemingly experiences indecision and it never occurs to the Emperor that Vader might intervene. Is this just extreme overconfidence on the Emperor’s part, again? Or does he have good reason to expect Vader’s continued loyalty even if he (the Emperor) chooses to kill Vader’s son in front of him? Well, in the Emperor’s defense, Anakin/Darth Vader had a solid history of not just watching innocent children die, but murdering them himself. He killed those Tusken Raider babies in Attack of the Clones, and the adorable Jedi moppets in Revenge of the Sith. Additionally, Vader only recently found out he had a son, and most of the time he and Luke spent together, they were generally fighting to the death. But mainly, Vader has been serving the Dark Side in general and the Emperor in specific for like 20+ years at that point. It’s not unreasonable to assume Vader would keep toeing the company line. Last but not least, the Emperor is not only super-evil, he has no family ties. He probably couldn’t even imagine the power of the bond between a father and a kid, even an estranged father who cut off his kid’s hand with a laser-sword. I doubt Palpatine could even imagine Vader betraying him — at least for Luke. For power? Sure. But not for his kid. Just saw the Batman Vs Superman trailer. I saw it in the theater, before a press screening of Avengers 2 here in Brazil. That awkward silence after the “you will” part? Yeah, here in Brazil we usually go nuts after a long waited comic-book movie trailer like this. Like, Comic Con nuts. But this one.. no one even showed a reaction. Well, anyway, I just find amazing how hard is to do a Superman movie without strongly relying on the religious symbolism of the “savior” figure. Will we ever have a Superman movie that’s just a comic book/sci-fi movie? Can it be done? It can be done. Easily. Please check out, uh, 99% of all superman comics and all non-Zack Snyder-directed Superman movies. I’m not saying Superman can’t be used as a Jesus-y savior, I’m just saying Superman does more actual saving than Jesus-ing. That is to say, he usually saves us because of his character and his heart and his superpowers, not through his misery and suffering and death. Zack Snyder is really, really interested in seeing Superman suffer. Man of Steel is just two hours of moral anguish, where he has to decide if saving children from drowning is a good thing or not. But the new trailer shows, BvS is kicking the religious symbolism into high gear. Who’s worshipping Superman as a god? Who is getting so furious at the knuckleknobs who are worshiping Superman as a god that they’re spray-painting mediocre statues of him? Why does Batman not only want to fight Superman without gauging his intentions, but wants to verbally threaten him so he knows he’s going to make Superman suffer for the hubris of having superpowers? Seeing Batman and Superman finally fight onscreen will be thrilling, no matter what. But I would love it significantly more if this scene would happen without Superman indulging in a massive messiah complex or Batman sounding like a playground bully.